“Oh great, cheese, nothing goes better with cheese than some mold. I've got some hookup on some black mold! Anyone who has ever dealt with some of those pro-molders has probably heard statements like these ones countless times (occasionally subbing in Shaq's far inferior “Blue Chips”). I'm going to slap all these people in the face right now when I say this. Food should not be furry. 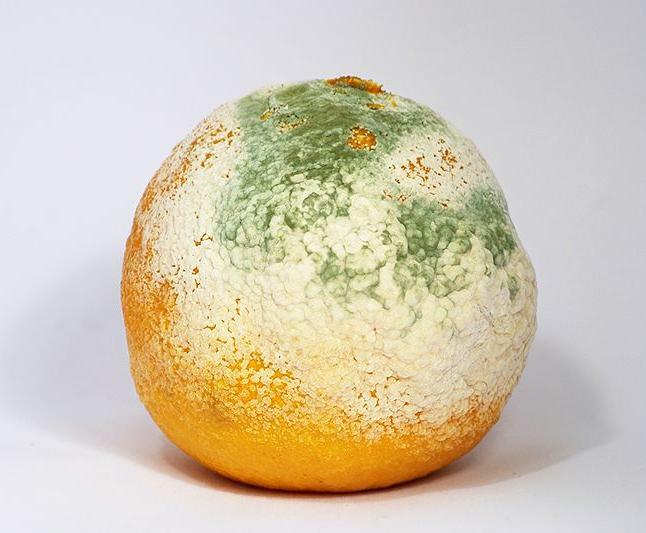 Mold says "Oh my darling, oh my darling Clementine." Everyone else says "... ew." And this isn't some vegetarian diatribe brought on by the fact that I live with a vegetarian. No, food should not be furry, because it should not be moldy. Yet if the pro-molders are to be believed, mold is a delicacy and should make anyone happy to dine upon it. Well, unlike the majority of people, I am against mold. Whereas it seems everyone thinks mold is the greatest thing since sliced mold, I dislike it greatly. Mold frightens me. Just seeing that green or black or white blob of fuzz sends shivers down my spine. When I open the refrigerator and find that unwelcoming hue of awful, I treat it like it's a spider of some sort. I don't make eye contact with it and with great speed I send it to the nearest portal to hell. Spiders and mold, they deserve each other—especially if one eats the other, although I'm really not sure which way that would operate. I'd hope they both eat each other in one of the great murder-suicides-two-birds-one-stone of our time, but alas, that's probably just fantasy on my part. So we're stuck with mold. Just like it sticks to us. It's not like I haven't tried liking mold. Lord knows I've tried, I've put it on everything from my oranges to strawberries to fruit cups, but none of them tasted very good. They tasted downright poisonous, in fact. Even when I tried jazzing it up by placing it in a Jell-o mold (AKA a “mold mold”), it just set off my pun sensors and did little for my not-getting-grossed-out-sensors. Maybe if all the mold types coordinated into a pleasing layout. Just imagine some sort of plaid or 1990s Neon Crayola swath, I could dig that. But instead those organisms usually only stick to one or two color palettes, and I really don't dig the white-on-green-Philadelphia-Eagles-inspired-mish-mash combination of color. Many people claim that because molds play a large role in the production of food, beverages and enzymes, we should view mold formations of food as an evolution, a delicacy . Well, faced with that post apocalyptic society where awful greens and whites exist, I don't want to live there.